So my cupcakes from last night did not turn out the way I want it to. I planned on decorating the cupcake. I frosted it with yellow frosting and tried to put a chocolate covered graham cracker on it. This was supposed to resemble a chalkboard. I iced it with 1+ 1 and added a white candy to look like chalk. I also added a red m & m with green icing for an apple. Well the graham crackers refused to stay in place. 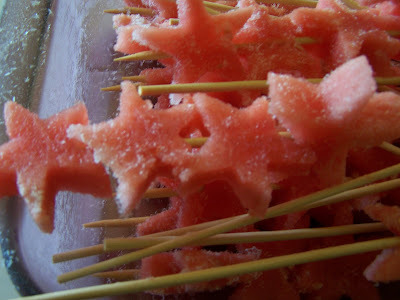 I finally gave up and this morning I decided to cut up water melon into little star shapes and placed them on a stick. This took a long time. I then put it in the freezer while I showered and got dressed to go to school. Priyasha was thrilled to go to brother's class. She sat at a table and had a snack too. Pravan got to pass out the napkins and he looked so proud and happy to be doing that. At first some of the kids did not want the snack but when they tried it they came back for seconds. 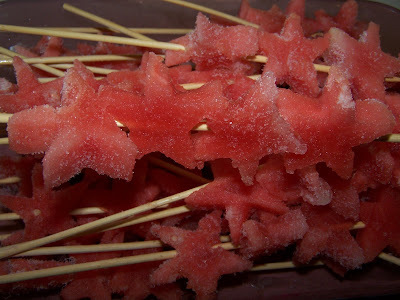 I was happy that they had a cool ( literally cool ) snack. It was a hot day and Pravan said "that was a great idea mom ". Priyasha and I stayed for a short while and then we headed of to lunch. I met a dear old friend Heleene and we had lunch together. It has been a long long time since we saw each other. I was surprised that she brought me a belated birthday present. My birthday was in April. It was so sweet of her. We had a good time and Priyasha got a balloon when we left and said to the hostess " Can I have one for buther ? " That was so sweet of her. It was nap time when we got home. I had very little time to do the dishes and clean before Pravan got home. I was also tired from the busy morning. When Pravan got of the house I discovered that he left his lunch box in school. I was not happy but I guess he will have to learn to remember these little things as mom is no longer always there to nag him. This is a long weekend and I am looking forward to it. Have a happy and safe Labor day weekend.